This week we are taking a look at the latest game from USAopoly - Deadpool Vs. The World. That's right, the Merc with a Mouth is back, with his own 17+ party game. Deadpool Vs. The World is a party game for 3 to 10 players, where players compete to collect 5 WTF Cards. Each round the First Player will randomly select a WTF? Card and the other players will compete to create the best caption for the Deadpool picture on the WTF? Card. Each caption card has a sentence with a blanked out word that players add to match the picture on the WTF? Card. The player with the best caption for the round wins the WTF? Card, then First Player rotates and another round begins. The game ends when a player has collected 5 WTF? Cards. Deadpool Vs. The World offers a large group party game, suited for 3 to 10 people. The game is based heavily on the Cards Against Humanity game but does offer enough of a twist to stand on its own two feet. Expanding on the CAH mechanic, players fill in the blank on the caption card to match the WTF Card. This offers players more creative ability and greater replayability. While you will likely see repeat cards the more you play, the context of the card can be significantly different. Despite the ability to fill in the blanks, we still found that sometimes the cards in our hands just didn't match the WTF Card and that we just had to throw a random card. This also lead to some serious AP, because you have to think of a line or word it took some players longer than others to come up with a word or phrase to fit the card. Based on this we might recommend making some house rules, by upping the hand size and/or allowing players to swap out cards, and limiting player time these issues would easily be corrected. The best thing about Deadpool Vs. The World for us is the theme. We actually volunteered to review this game because we love the comics and the game has great art. Unlike other party games where there is no real theme and players just try and say the most obscene thing that pops into their head, Deadpool reigns that in. We all know just how offensive Deadpool can be, so there is a little more reason to be offensive in this game and it is definitely marketed that way but having the scene on the WTF? Cards keeps players more on point. If the caption doesn't match the artwork, then why play it. Deadpool: The Complete Collection (#3). Despite saying that the theme fits better, as big Deadpool fans, I will admit that we were a little disappointed that they didn't do more with the IP. 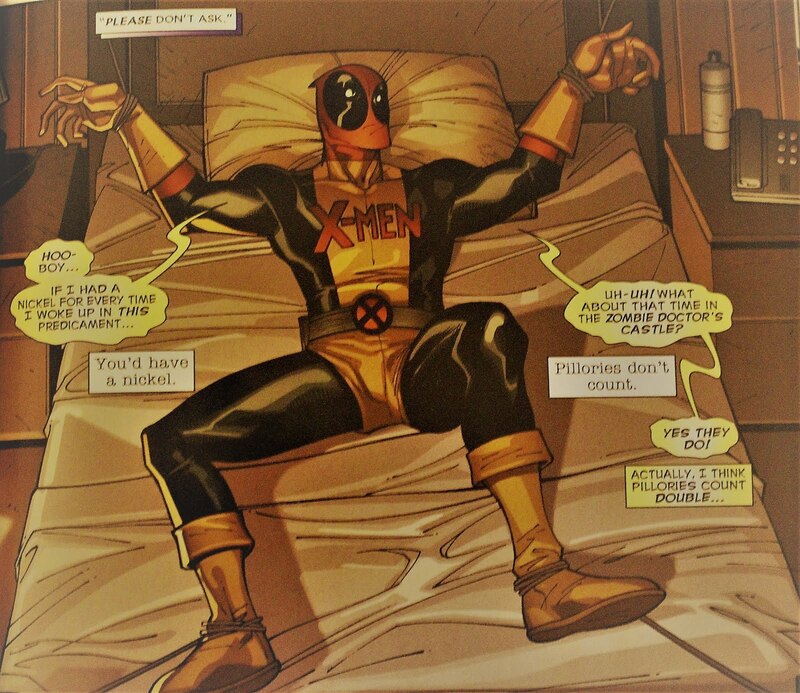 Both the Deadpool movies and comics have some amazing humour and hilarious scene, but none of that really transferred over. There are a number of things that the game is missing that could have given it a more Deadpool-esq feel. For example, they could have included references to Bea Arthur, Chimichangas, or Deadpool's obsession with his mistress, death. (I get that a direct reference to Bea Arthur would have been hard due to legalities but a nod to the golden girls or one of many other works would have been nice). All in all, I think that this is an improvement to the CAH type party games, giving more options, better replayability, and a purpose for the humour. 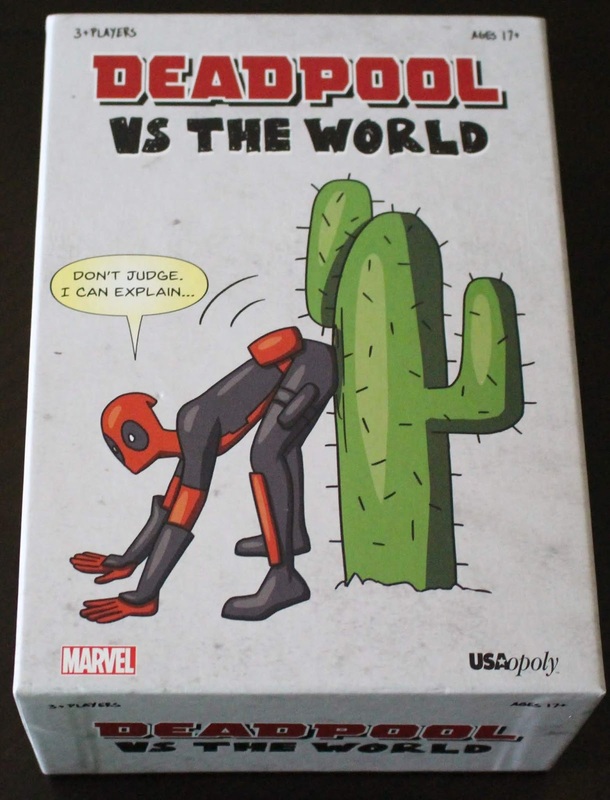 So, if you love Deadpool and/or CAH and are looking for the next big thing you may want to consider this quick, offensive 3-10 player party game. Overall, we enjoyed Deadpool Vs. The World for what it is, and will likely break it out again around the table at parties.